During WWII, the Boeing B-29 Superfortress was developed to fly the thousands of miles necessary to bomb Japan from U.S. military bases. This huge bomber, America’s newest weapon, carried an eleven-man crew and ten tons of bombs. It was instrumental in winning the war in the Pacific.The author has collected intimate accounts of B-29 crewmembers who flew combat missions against Japan. Marshall, a B-29 pilot who flew thirty missions, adds perspective with insightful commentary and excerpts from his personal combat diary.Experience gripping recollections of pivotal events in the 20th Century’s bloodiest conflict. Storm the black sands of Iwo Jima with a young marine, and follow fighter escorts as they outmaneuver attacking Japanese Zeros. 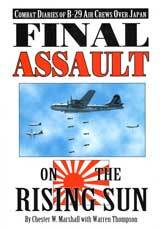 Wrestle the controls of a bucking B-29 tossed high above Tokyo by thermal winds as the city burns beneath it. Sit in on the face-to-face reconciliation between a B-29 crewmember and the Japanese fighter pilot who shot him down over Tokyo.Fire bombs dropped by B-29s gutted most major Japanese cities. Then, modified B-29s, the only planes capable of carrying the enormous load, dropped the two atomic bombs that ended the war. 224 pages, hardbound, 125 color and b&w photos, 7.5” x 10.5”.